Although some people think of Blue Jays as a nuisance, they are highly intelligent and beneficial birds to have in most yards. The trick is to give them what they need apart from the smaller songbirds. Jays are large and can be aggressive. Choose the right bird feeder just for attracting Blue Jays and you’ll be enjoying these vibrantly colored songbirds most of the year in North America. Blue Jays have earned a bad reputation with some wild bird enthusiasts. These large and sometimes “bully” songbirds have been known to kill hatchlings, empty feeders quickly and then demand more bird food in a noisy and obnoxious way. With this in mind, you may wonder why anyone would want Blue Jays in their yard, but hold on! All birds have a part to play in their ecosystems. None are “good” or “bad”. Blue Jays are some of the most entertaining birds you can watch. Vibrantly colored, intelligent and highly active, you’ll fall in love with them just like we have–if you handle attracting them properly. Choose one or two of the feeder types below, ideally two different kind. Set them up in an open area, away from other bird feeders that are intended for smaller birds. Keep them filled and clean. In this way, Blue Jays can enjoy the yard alongside other birds without incident. Hopper Feeders: Almost all backyard birds will eat from hopper style feeders and Blue Jays are no exception. Black oil sunflower seed and unshelled peanuts will both work for Jays, depending on which type of feeder you choose. We recommend avoiding large capacity feeders for Blue Jays. Instead, portion out a daily ration so the food is expected, but not horded or gorged on. Mealworm Feeders: Blue Jays love mealworms and other insects, particularly in winter. However, with their large size and voracious appetites, this type of feeder can become expensive. We recommend offering mealworms to Jays only in winter on years they are not migrating. Suet Feeders: Like most wild birds, Blue Jays love Suet–particularly during cold winter months. If you’re offering this type of bird food to them make sure you have chosen an extra-sturdy model of the feeder. Many of the basic wire suet feeders are not made to accommodate large songbirds like Blue Jays. Tube Feeders: One of the most economical ways to feed these birds is with a wire tube feeder filled with peanuts or corn. Just make sure you’re choosing a sturdy model. Tray Feeders: Perhaps the easiest way to feed Blue Jays, a platform or tray feeder is a great choice for providing peanuts, corn, sunflower seed or suet blocks for hungry jays. 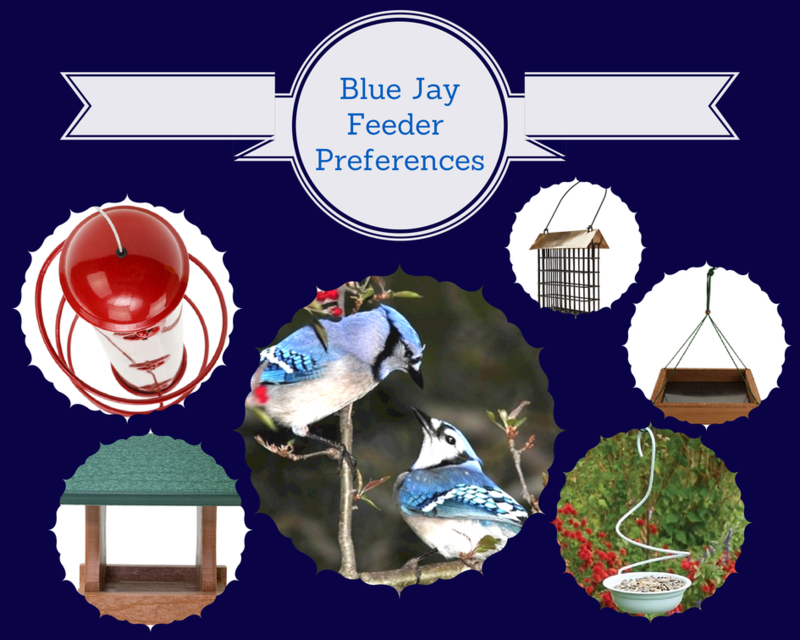 By taking a little time to understand Blue Jay behavior and choose the right feeders just for them, backyard bird lovers can enjoy vibrant Jays and smaller songbirds too!